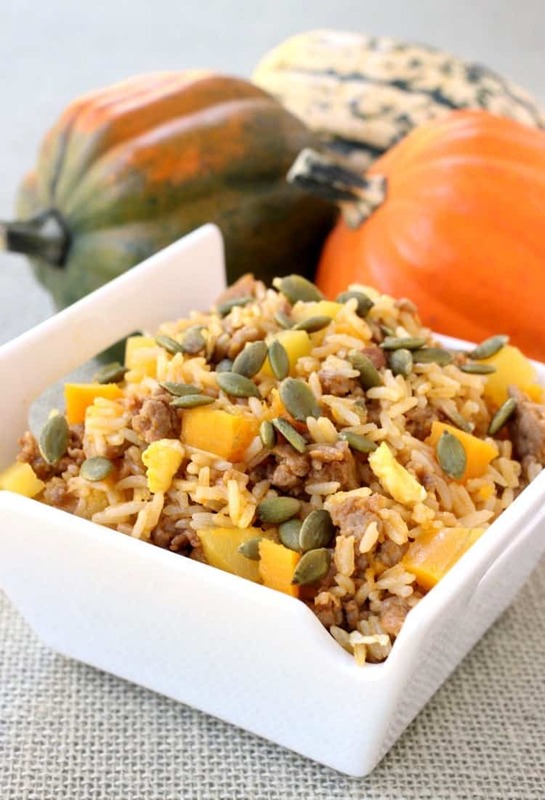 Fall Fried Rice is the perfect fried rice recipe for Fall! 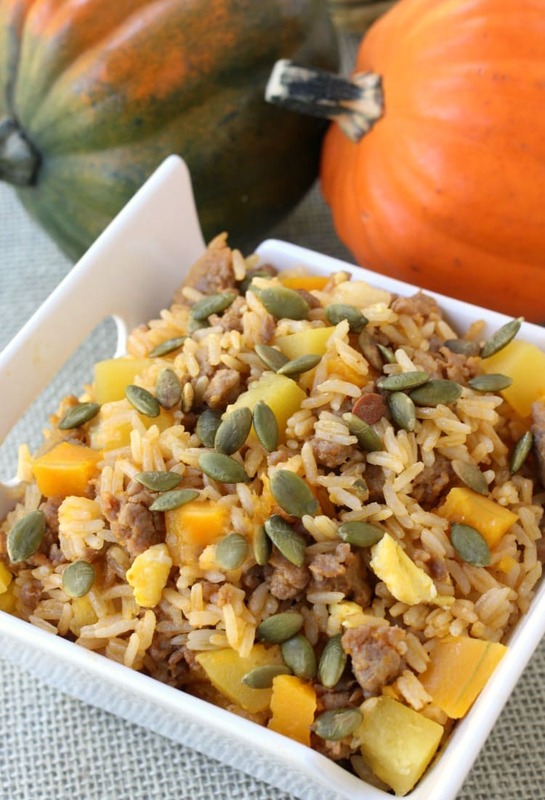 Loaded with fresh squash and sausage, you’ll want to make this fried rice all the time! 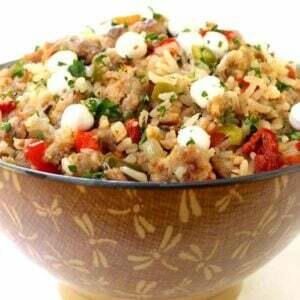 We love making all kinds of rice recipes for dinner like our Spicy Mushroom Rice and even Cauliflower Rice recipes! I think you guys know by now how much we love fried rice around here. It started out with our basic pork fried rice that we make all the time, then it turned into remaking our favorite Hibachi Pork Fried Rice at home…from there we’ve had Chicken Fajita Rice and Italian Fried Rice…we like our rice for dinner. So it was a totally normal thing for me to come up with this Fall Fried Rice for Fall. It just had to happen. This fried rice recipe has acorn squash, butternut squash and pumpkin puree all to make the fall flavors really come out. It’s so easy you won’t believe it. One of the keys to making any fried rice recipe is that you have to have all your ingredients prepped and ready to go ahead of time. That way when it’s time to start cooking and you’ve got a hot wok, everything is ready to go because recipes like fried rice are usually cook very quickly. Another great tip we’ve learned over the years is to cook your rice ahead of time, then let it cool completely. When the rice is warm it tends to be softer, mushy you might even say. ou can also grab white rice from your favorite Chinese take out place! For this Fall Fried Rice, start by browning the sausage in wok or a large skillet. 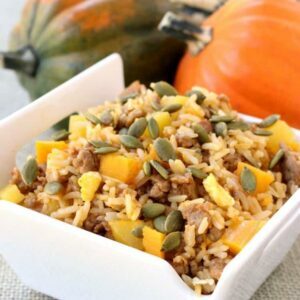 Next stir in the pumpkin, cooked rice and the cooked squash cubes…you’re almost there! All it needs is a few seasonings and some crunchy roasted pumpkin seeds on top. 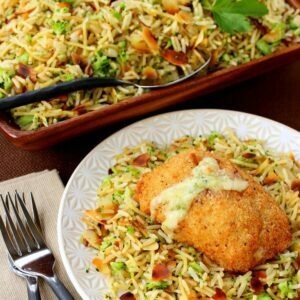 Well, this fried rice recipe is also great with a nice cold beer on the side to wash it down. But other than that – it’s pretty perfect all on it’s own. 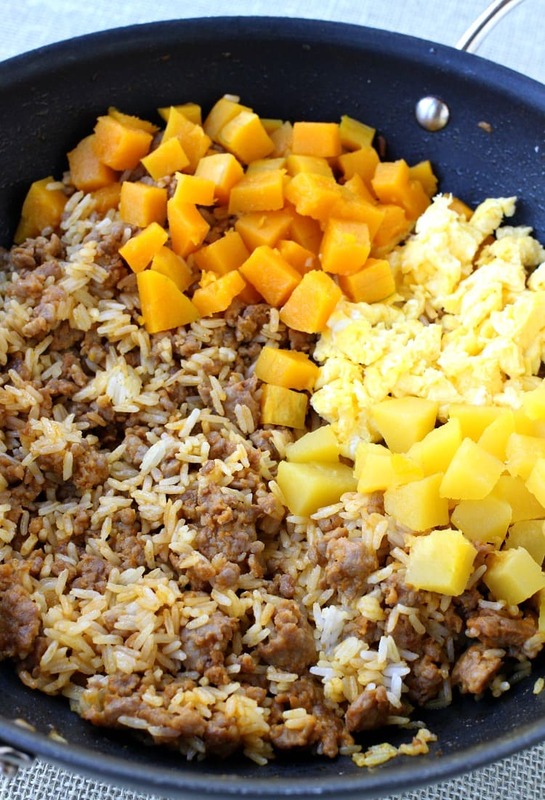 This delicious and hearty fried rice recipe is perfect for soaking up all the flavors of fall! You can buy already cut up squash that you can microwave right in the bag from the grocery store! What a great fall side dish! This is the quintessential fall food! Gorgeous! Love the pumpkin seeds garnish on top. And this looks great! The pumpkin seeds definitely make it – thanks Megan! 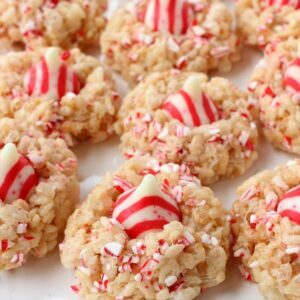 This looks like an amazing fall recipe!